Thanos is easily the deadliest foe the heroes of the Marvel Cinematic Universe have faced thus far, though it still had to be surprising to fans just how beaten their heroes looked by film’s end. Thing is fans that hung around till the end got a special surprise as the after-credits scene shows Nick Fury hurridly sending a message off before he fades out of existence. 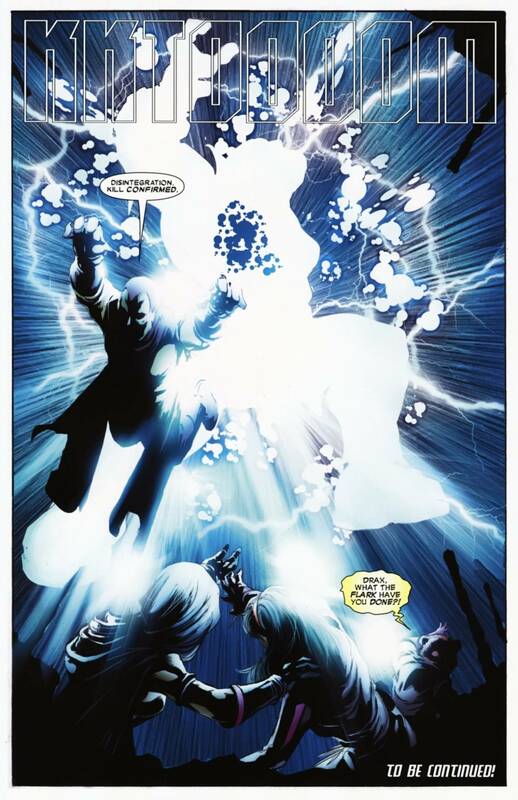 The device falls to the ground as he fades away and upon sending flashes the symbol and colors of Captain Marvel. The true power of Captain Marvel – Who is Carol Denvers? It’s no secret that Marvel is laying down the hammer with the build-up to Avengers 3 with the strongest, most sinister and evil villain the superhero world has ever seen: Thanos. 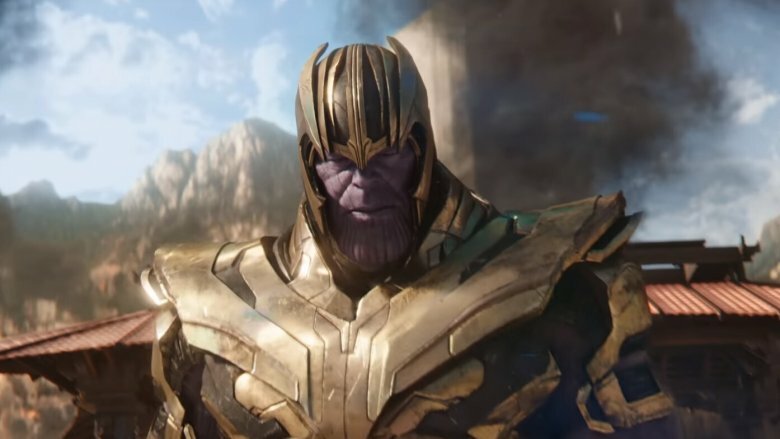 If you’ve seen the end credits of the first Avengers movie, as well as the end credits of The Guardians of the Galaxy then you would have seen the mysterious Thanos. We also had a third glimpse of Thanos in the Marvel Phase 1 & 2 recap video. Who Can Kill Thanos? We take a look at the sinister Mastermind named Thanos? Batman v. Superman – Who is Darseid? The history of Thanos is both long and detailed. He’s done some pretty epic evil stuff in his life. 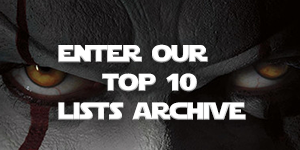 He’s had wars with just about every marvel group of superheroes that exist. 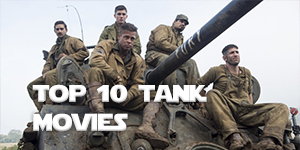 Avengers, Spiderman, Fantastic Four to name a few. Here’s a few highlight on where he came from, and some of his most evil deeds. On Saturn’s moon of Titan lived a colony of Eternals, and Thanos was born as one of the last sons of the original colonists, Mentor and Sui-San. However, he was born misshapen and monstrous in comparison to the other Eternals, particularly his handsome and carefree brother, Starfox, and Thanos grew into a melancholy, brooding individual, consumed with the concept of death. More than any of his people, Thanos sought out personal power and increased strength, endowing himself with cybernetic implants until he became more powerful than any of his brethren. Thanos himself once claimed that he vivisected his own mother in an attempt to investigate how someone consumed with death such as himself could have come into being. Thanos believed that Death had rejected him after his failure with the Cosmic Cube in which Mar-Vell managed to con him into defeat, and so he began searching the universe for the powerful Soul Gems. 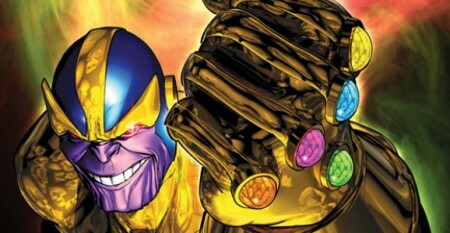 One by one, Thanos collected five other Soul Gems, combining them all in a huge, single, synthetic Soul Gem. He then began to extinguish the very stars themselves, hoping thereby to extinguish all living things in tribute to Death. Thanos was opposed by Gamora, but he slew her as well as Pip the Troll, who was looking for Adam Warlock. 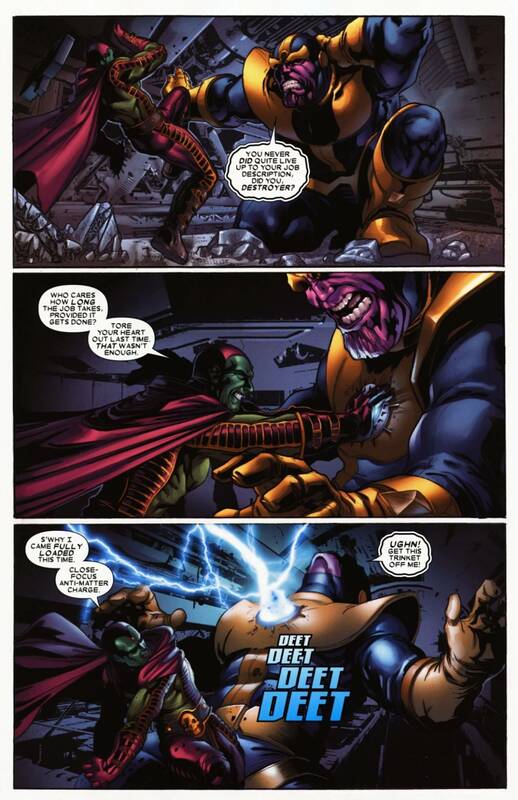 Warlock had learned of Thanos’ activity and recruited Captain Marvel and the Avengers to again oppose the mad Titan. He appeared in Asgard, searching for the “Designate”, a being of phenomenal cosmic power said to play a major role in the cosmic scheme of eternity. He found allies in Tarakis and the monstrous Mangog, using Mangog to lay waste to the planet Rigel in order to collect the final ingredients to find the Designate. Thanos found her in the person of Tarene, but was confronted by Thor and his allies, a Rigellian recorder android and Firelord. All the signs began to fall into place, and Thanos nearly gained the power of Ragnarok– the end of the world– as evidenced by Thanos’ destruction of an unknown but inhabited planet. However, Thanos fell under the attack of Thor and his allies, and Tarene wept again for the lives of those slain by Thanos. Her tears seemed to destroy him, causing him to burst into an all-consuming hellfire, seeming vanquished forever. Thanos possesses the superhuman physiology of all Eternals, granting him superhuman strength, endurance, reflexes, and agility. His skin in nearly invulnerable, particulary against heat, cold, electricity, radiation, toxins, aging, and disease, and he can survive indefinitely without food or water even before his “curse” from Death left him immortal, unable to die. His mind is also invulnerable to most forms of psychic attack, and can project a psionic blast of energy as well as blasts of plasma/cosmic energy from his eyes and hands. 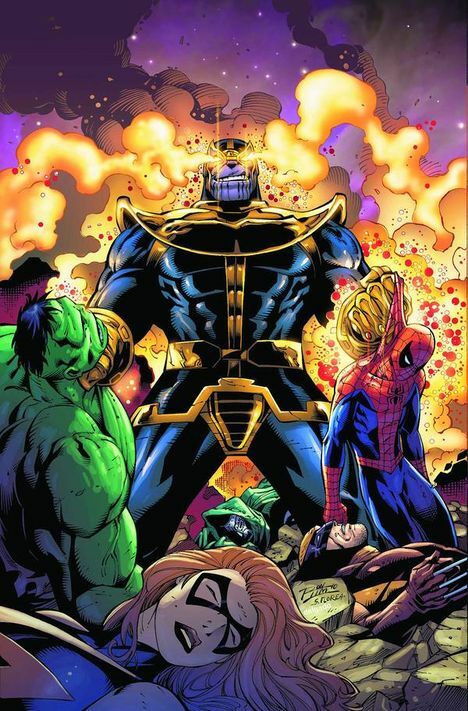 What will Thanos do in the Avengers 3? In a mid-credits scene in The Avengers, we find out he was the one who provided Loki with the army Loki used to invade Earth. In Guardians of the Galaxy, he sends his prized assassins Gamora and Nebula to help Ronan. In both cases, Thanos’s has only one thing on mind: I’ll help you if you can get me one of the Infinity Stones. 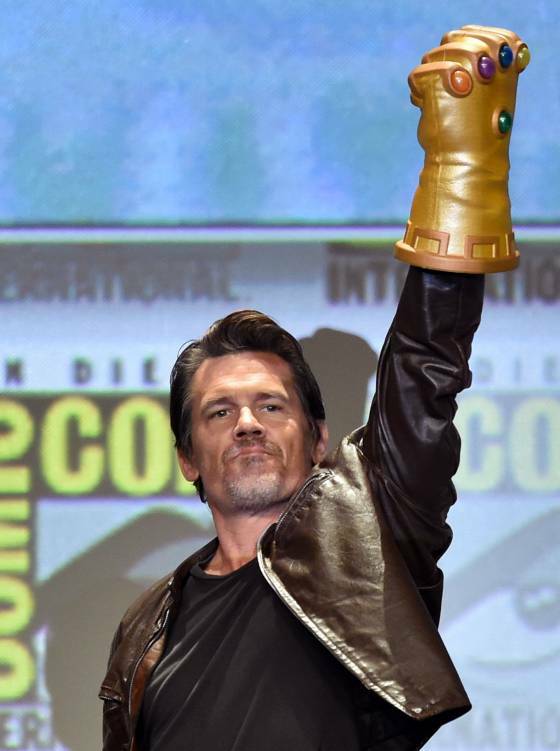 But at last weekend’s San Diego Comic-Con, Josh Brolin wore the Infinity Gauntlet onstage, so things are probably going to look up for the Mad Titan’s quest. 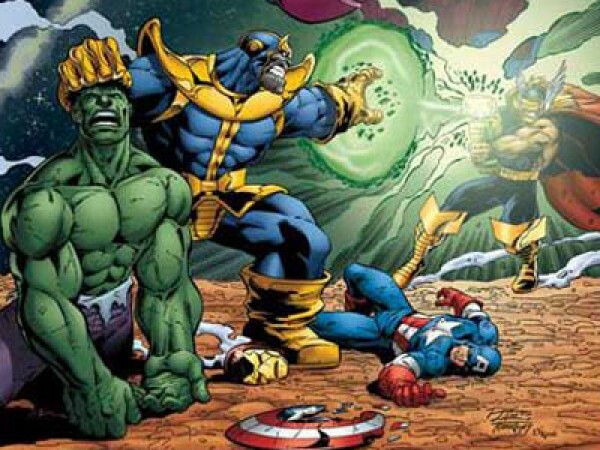 The rumor is that Thanos will be the main villain in the third Avengers movie, which will probably come out in 2018. This is a highly speculative debate. Nobody has ever succeeded in truly killing Thanos. What certain superheroes have done is stop him, or remove his super superior weapon. But, it is a fun debate nonetheless. 1. Death – The one option here is Death itself. 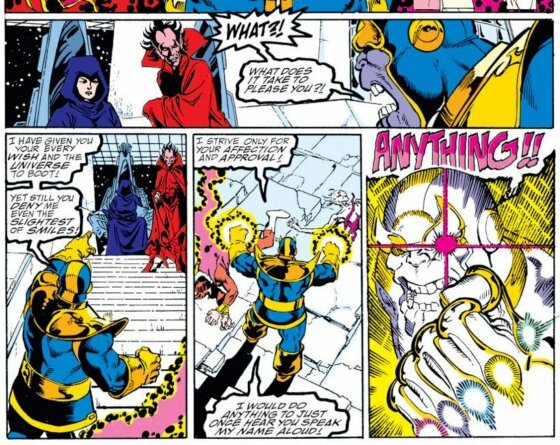 As we know death is an embodiment in the Marvel universe, and the main reason for Thanos doing what he’s doing. Hence it would make sense that death itself can kill him. It’s worth mentioning that since this, Thanos was said to be recuperating at a fast degree and yet he still appears weakened in comparison to his former self, that weakness being originated by his proximity to the Cancerverse. That being said, the Cancerverse itself is the most probable reason as to why he’ll survive disintegration by Drax, as there is no death there. 3. Current Silver Surfer – Current being the imperative word here. Galactus after he consumed a planet. Yup, Galactus is another possibility. that is if we consider “God-like” heroes with Odin’s power and above. Ant-Man. My guess he shrinks down, climbs inside the gauntlet, and shimmies it off. Yup, that would technically be stopping Thanos, and not killing him. Weasel-Mint could do him, easy. Might need a little help from UrQheart but hey, Thanos is quite a formidable opponent. Ghost Rider would be my choice to kill Thanos. A little hell fire never hurt anyone right? I am not really trying to argue with you here but if Thanos were to kill Ghost Rider he would just be wasting his time to have Ghost Rider come right back after someone would need to be avenged. Ghost Rider is the spirit of vengeance he can be killed but only for a very short period of time. Someone will always need to be avenged. Thanos may win the battle but would not win the war. Although I do believe it would depend on which version of Ghost Rider he faced. And there are a lot of other variables that would go into a battle between the two. But I am still sticking with Ghost Rider. And my pick is the Dan Ketch/Noble Kale version. Frank Castle. Death is the voice speaking to him in the “Born” story arc. It offers him a war that will never end if he only will say the word. So in effect, he is Death’s agent. . . meaning, he can kill Thanos. I’m pretty certain this is where Marvel is going. Don’t act like it isn’t true. Besides, Frank could kill Thanos without Death’s help just by virtue of his badassnessosity. . . This is why Marvel reacquired The Punisher from Lion’s Gate. You’ll see. Very interesting theory. Who do you think would play a great Frank Castle? Yeah, him too. . . naturally. Ray Stevenson was perfect. I liked Tom Jane too, but it seemed like he would pull his punches. . . not Ray. . . not Ray at all. He turned the punishment up to 11, as is tradition. He’s already Volstagg though, so I don’t think we’ll be seeing him as Frank. Plus I’m sure Marvel will want to start fresh. I’m also confident they’ll cast someone no one has considered, likely from a big TV show, but possibly a supporting character. I could get behind Pedro Pascal. Don’t get me wrong, I like Pedro. He just seems more like a gouged eyes kind of guy than he who would do the gouging. I think he’d make a good jedi. Lmao, fair enough. I’m sure he’s going to pop up in one of these major franchises. I certainly hope so. He’s impeccabru. I agree. Castle is going the way of the Xcutioner. By that I mean he collects Marvel’s weaponry. He just broke off Ghost Rider. Haha couldn’t help but really laugh out loud when I read this. Remember MTV’s celebrity deathmatch? I’m thinking special edition featuring Thanos and Chuck Norris! That would settle the score now wouldn’t it?! I think Hawkeye could take him. Screw Thanos being in Avengers 3 Marvel. 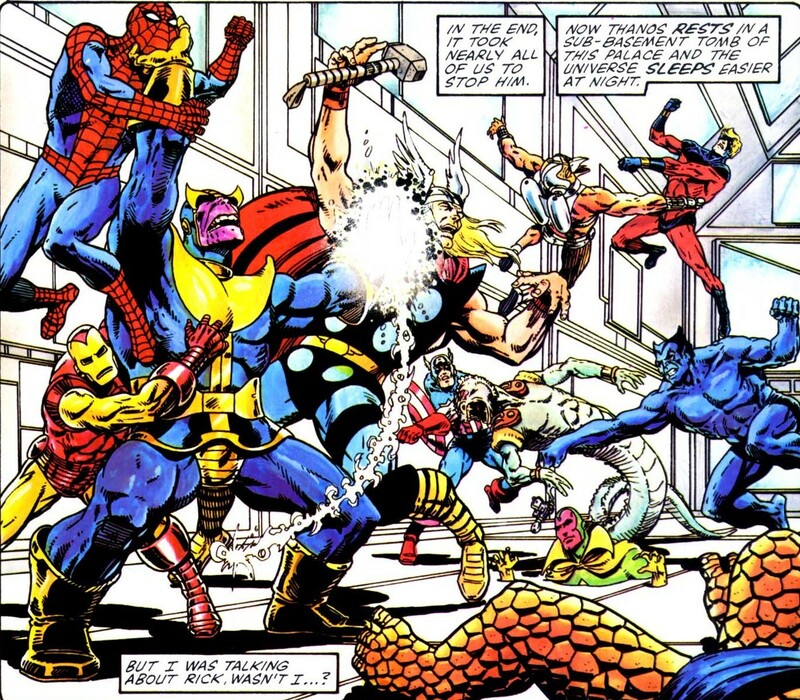 Just go all out and do the most awesome thing ever and do an Infinity Gauntlet film. Marvel can pull it off and everyone who is not in the know would get to truly see Thanos in all his death worshiping power. Can I get a hell yeah commenters? It would have to be a team effort. Darkseid! Thanos is basically a tribute to Darkseid. Goku. Superman. The Care Bears, with their Care Bear Stare. Popeye, assisted by Olive Oil. The Doctor. Shatner. Luke Skywalker. My mum. Zeus. Lassie. The kid from Home Alone, Kevin. Batman, with both arms tied behind his back and unconscious. Bruce Lee. Ellen Degeneres. The Flintstones. Bob Hope. HAL 9000. Troy Tempest. Kermit. The Blues Brothers. Wall.E. David Bowie. Skye (that’s my dog). Not any one person, just Disney. All they have to do is bribe Death, and bam, he’s dead. Dr. Doom. He was the only human Thanos mentioned he wouldn’t want to mess with. Deadpool did in Deadpool kills the marvel universe. That Deadpool is dead though. Also he’s called Dreadpool apparently. Who can kill Thanos? Are we forgetting the mad titan loathes being alive in the first place? Thanos would eviscerate Frank Castle despite his “I eat rusty nails for breakfast” attitude. It’s going to take either Drax the destroyer, or Adam Warlock to bring down the mad titan…..Joaquin Phoenix is going to play Dr.Strange…Maybe he could? So why not the Hulk?